With great sadness we announce that Sir Michael Atiyah, Chair of the HMI Scientific Advisory Board for 10 years, passed away on January 12, 2019. April 16, 2019. TCD Theoretical Physics Seminar. Alessandro Torrielli (University of Surrey). Massless Scattering in Lower Dimensional AdS/CFT. Seminar Room House 20, 2pm. May 8-10, 2019. HMI Workshop AGA Analysis, Geometry and Algebra. Organized by Seán Dineen, Chris Boyd, Vladimir Dotsenko, Michael Mackey, Pauline Mellon, Donal O'Donovan. May 13-17, 2019. HMI Workshop Gauge Theory and Virtual Invariants. Organized by Martijn Kool (Utrecht University), Jan Manschot (HMI/TCD), and Sergey Mozgovoy (HMI/TCD). May 20-22, 2019. Hamilton Mathematical Physics School. Organized by Tristan McLoughlin, Martijn Hidding, Georgios Korpas, Andrea Orta, Paul Ryan, Anne Spiering. May 23-24, 2019. Irish Quantum Foundations 2019 Meeting. May 27-31, 2019. HMI Workshop Homotopy Meets Homology. Organized by Vladimir Dotsenko (HMI/TCD), Vincent Gélinas (HMI/TCD), Andrea Solotar (Buenos Aires). June 3-7, 2019. HMI Workshop Beyond the Discrete: Iterative Methods from the Continuum Perspective. Organized by Kirk Soodhalter (HMI/TCD). April 12, 2019. TCD Theoretical Physics Seminar. Peter Tadic (TCD). On the Convergence of the Gradient Expansion in Hydrodynamics. Seminar Room, House 20, 2pm [NOTE UNUSUAL DAY: THIS SEMINAR IS ON FRIDAY]. April 10, 2019. Dublin Theoretical Physics Colloquium. Francesca Day (University of Cambridge). The Astrophysical Search for String Axions. Synge Theatre, House 20, 4pm. April 8, 2019. Trinity College C.A.M.S. Seminar. Jelena Jovicevic (CERN). Revealing the nature of the largest Higgs Yukawa coupling. Joly Lecture Theatre, Hamilton Building, 4pm. April 4, 2019. Dublin Mathematics Colloquium. Johan Leray (University Paris 13). Double Poisson Algebras up to Homotopy. Synge Theatre, Hamilton Building, 4pm. April 4, 2019. TCD Theoretical Physics Seminar. Rajesh Gupta (King’s College). Exact Computations in Supersymmetric Quantum Field Theory on AdS. Seminar Room House 20, 2pm. April 3, 2019. Dublin Theoretical Physics Colloquium. Debasish Banerjee (Humboldt University Berlin). Quantum Link Models to Probe New Aspects of Gauge Theories. Synge Theatre, Hamilton Building, 4pm. April 3, 2019. TCD Geometry Seminar. Matija Tapuskovic (Oxford University). Motivic Galois Coaction on 1-loop Motivic Feyman Amplitudes. New Seminar Room, Hamilton Building, 11am. March 28, 2019. Dublin Mathematics Colloquium. Alex Fink (QMU London). Some Tropical Geometry. Synge Theatre, Hamilton Building, 4pm. March 28, 2019. TCD Theoretical Physics Seminar. Brenda Penante (CERN). Elliptic Polylogarithms and Feynman Integrals. Seminar Room House 20, 2pm. March 27, 2019. Dublin Theoretical Physics Colloquium. Chris Blair (Brussels). Non-Riemannian Geometry of M-theory from Exceptional Field Theory. Synge Theatre, Hamilton Building, 4pm. March 27, 2019. Trinity College Computational Applied Mathematics Seminar. Marie Kubínová (Czech Academy of Sciences, Ostrava, Czech Republic). Is Any Convergence Behaviour Possible for Block GMRES? Synge Theatre, Hamilton Building, 1pm. March 22, 2019. TCD Geometry Seminar. Marton Hablicsek (University of Copenhagen). Extra Structures on Deformation Quantizations of Shifted Symplectic Derived Stacks in Positive Characteristics. New Seminar Room, 4pm. March 21, 2019. Dublin Mathematics Colloquium. Marton Hablicsek (University of Copenhagen). Derived Intersections and Interactions with Deformation Theory. Synge Theatre, Hamilton Building, 4pm. March 21, 2019. Theoretical Physics Seminar TCD. Gim Seng Ng (TCD). Black Holes, Heavy States, Phase Shift and Anomalous Dimensions. Seminar Room House 20, 2pm. March 20, 2019. Dublin Theoretical Physics Colloquium. Stefan Vandoren (Utrecht University). Black holes from string and F-theory, and (0,4) CFTs. Synge Theatre, Hamilton Building, 4pm. March 20, 2019. HMI Simons Visiting Professor Francis Brown (Oxford) will be giving his Simons Foundation Distinguished Lecture titled New perspectives on Periods and Integration, with Applications to Physics. Mathematics Seminar Room, House 20, TCD, 2pm. March 14, 2019. TCD Theoretical Physics Seminar. Yang Zhang (Max Planck Institut für Physik). Analytic Results for Two-Loop Five-Point Nonplanar Amplitudes. Seminar Room, House 20, 2pm. March 13, 2019. Dublin Theoretical Physics Colloquium. Blake D. Sherwin (University of Cambridge, DAMTP). CMB Lensing: Fundamental Physics from Maps of the Invisible. Synge Theatre, Hamilton Building, 4pm. March 13, 2019. Trinity College Computational Applied Mathematics Seminar. Ronny Ramlau (Johannes Kepler University, Linz, Austria). Inverse Problems in Adaptive Optics. New Seminar Room, House 20, 10am. February 27, 2019. Dublin Theoreticl Physics Colloquium. Agnese Bissi (Uppsala University). Quantum Gravity from Conformal Bootstrap. Synge Theatre, Hamilton Building, 4pm. February 27, 2019. Computational Applied Mathematics Seminar @TCD. Alberto Ramos. Automatic Differentiation for Error Analysis of Monte Carlo Data. Seminar Room, School of Mathematics, TCD, 11pm. February 20, 2019. Dublin Theoreticl Physics Colloquium. Sara Pasquetti (Milano). Dualities and Exact Methods in SUSY Gauge Theories. Synge Theatre, Hamilton Building, 4pm. February 13, 2019. Dublin Theoretical Physics Colloquium. Jan de Boer (University of Amsterdam). Probing Typical Black Hole Microstates. Synge Theatre, Hamilton Building, 4pm. February 13, 2019. Computational Applied Mathematics Seminar, TCD. Vera Guelpers (Edinburgh). Isospin Breaking Corrections to the Hadronic Vacuum Polarisation from the Lattice. Math Seminar Room, Hamilton Building, 10am. February 7, 2019. TCD THEORETICAL PHYSICS SEMINAR. Oliver Schlotterer (Uppsala). The Number Theory of String Amplitudes: New Relations Between Open and Closed Strings. Seminar Room House 20, 2pm. February 6, 2019. Dublin Theoretical Physics Colloquium. Alessandro Tomasiello (Milano). Conformal Field Theories in Six Dimensions. Synge Theatre, Hamilton Building, 4pm. February 5, 2019. Trinity College Computational Applied Mathematics Seminar. Kathryn Lund (École Polytechnique Fédérale de Lausanne, Switzerland). Block Krylov Methods for Matrix Function Evaluations. Lloyd Building, Room 201 (Vizualization Room), 3pm. January 30, 2019. Dublin Theoretical Physics Colloquium. Elias Kiritsis (Paris & Crete). Renormalization Group Flows Beyond Weak Coupling. Synge Theatre, Hamilton Building, 4pm. January 24, 2019. Dublin Mathematics Colloquium. Adam Keilthy (Oxford University). Relations and Filtration on Multiple Zeta Values. Synge Theatre, Hamilton Building, 4pm. January 23, 2019. Dublin Theoretical Physics Colloquium. Slava Rychkov (IHES/ENS). Walking, Weakly First-Order Phase Transitions, and Complex CFTs. Synge Theatre, Hamilton Building, 4pm. December 17, 2018. TCD Theoretical Physics Seminar. Paul Ryan (TCD). Separated Variables & Wave Functions for rational gl(N) spin chains. Seminar Room, House 20, 2pm. November 29, 2018. Dublin Mathematics Colloquium. Caner Nazaroglu (University of Cologne). Squashed Toric Manifolds and Higher Depth Mock Modular Forms. Synge Thetre, Hamilton Building, 5pm. November 27, 2018. Trinity College Computational Applied Mathematics Seminar. Roland Herzog (Technical University of Chemnitz, Germany). An Introduction to Optimization on Manifolds. Lloyd Building, Second Floor, Room 201, 3pm. November 21, 2018. Dublin Theoretical Physics Colloquium. Simon Badger (Durham U., IPPP). Amplitudes, Cross-sections and Precision Physics at the LHC. Seminar Room, House 20, 4pm. November 21, 2018. TCD PDE Seminar. Gurpreet Singh (TCD). Weak Solutions for Singular Quasilinear Elliptic Systems. Seminar Room, House 20, 2pm. November 8, 2018. Dublin Mathematics Colloquium. David Carchedi (MPIM Bonn). The Universal Property of Derived Manifolds. Synge Theatre, Hamilton Building, 5pm. November 7, 2018. Dublin Theoretical Physics Colloquium. Christopher Herzog (King's College London). Graphene and Boundary Conformal Field Theory. Seminar Room, House 20, 4pm. November 5, 2018. TCD Theoretical Physics Seminar. Mario Prausa (RWTH Aachen). Asymptotic Expansions via Dimensional Recurrence and Analyticity. Seminar Room, House 20, 2pm. November 1, 2018. FOURTEENTH J.L. SYNGE PUBLIC LECTURE entitled ON FALLING INTO BLACK HOLES by Professor Mihalis DAFERMOS (Professor of Mathematics, Princeton University, and Lowndean Professor of Astronomy and Geometry, Cambridge University) will be given in the MacNeill Lecture Theatre 3, Hamilton Building, Trinity College, on Thursday, 1 November, 2018 at 7.30 pm. October 31, 2018. Dublin Theoretical Physics Colloquium. Andrea Cappelli (INFN and Phys. Dept., Firenze). Field Theory Description of Topological States of Matter. Seminar Room, House 20, 4pm. October 25, 2018. HMI Simons Visiting Professor Francis Brown (Oxford) will be giving his Simons Foundation Distinguished Lecture at the next meeting of Dublin Mathematics Colloquium. Single-Valued Integration. Synge Lecture Theatre, 5pm. October 18, 2018. TCD Geometry Seminar. Alexander Isaev (Canberra). Isolated Hypersurface Singularities and Associated Forms. Synge Lecture Theatre, Hamilton Building, TCD, 5pm. October 17, 2018. Dublin Theoretical Physics Colloquium. Diego Hofman (Amsterdam). Generalized Global Symmetries: Formal Aspects, Holography and Hydrodynamics. Seminar Room, House 20, 4pm. October 16, 2018 - We celebrate W.R.Hamilton's Day. RIA organizes The Annual Hamilton Lecture at Trinity College. Martin Hairer (Imperial). On Coin Tosses, Atoms, and Forest Fires. The Lecture is kindly supported by Arup and the Irish Times. MacNeil Lecture Theatre, Trinity College Dublin, 7.30pm. To add to the celebration, Trinity Library has a display of Sir W.R. Hamilton's material in the current 'What is Life' exhibition in the Old Library that might be of interest, especially as the display includes the Quaternions notebook. October 16, 2018. Dublin Mathematics Colloquium. Alexander Isaev (Canberra). Homogeneous Hypersurfaces in C 3. Seminar Room, House 20, 3pm. October 11, 2018. Dublin Mathematics Colloquium. Timothy Logvinenko (Cardiff). Generalised Braid Category. Synge Theatre, Hamilton Building, 5pm. October 10, 2018. Dublin Theoretical Physics Colloquium. Nissan Itzhaki (Tel Aviv University). Average Null Energy Conditions and String Theory. Seminar Room, House 20, 4pm. October 10, 2018. TCD Geometry Seminar. Timothy Logvinenko (Cardiff). Bar Category of Modules and Homotopy Adjunction. Seminar Room House 20, 3pm. October 8, 2018. Theoretical Physics Seminar. Diego Medrano Jimenez (IFT Madrid). Sudakov Representation of the Cachazo-He-Yuan Scattering Equations Formalism. Seminar Room, House 20, 2pm. October 3, 2018. Dublin Theoretical Physics Colloquium. Konstantin Zarembo (Nordita). Ladder Diagrams. New Seminar Room, House 20, 4pm. September 27, 2018. Computational Applied Mathematics Seminar. Ben Hoerz (Mainz University). Variations on a Theme by Luescher. Viz Room, Lloyd building, 2pm. September 26, 2018. Dublin Theoretical Physics Colloquium. Yang-Hui He (City, University of London). Learning Algebraic Geometry: Lessons from the String Landscape. Seminar Room, House 20, 4pm. September 20, 2018. Dublin Mathematics Colloquium. James Griffin (Coventry). The Space of Circles. Synge Lecture Theatre, 5pm. September 19, 2018. Dublin Theoretical Physics Colloquium. Pedro Liendo (DESY). The Bootstrap Program for Defect CFT. Seminar Room, House 20, 4pm. September 10, 2018. Theoretical Physics Seminar. Saso Grozdanov (MIT). Pole-skipping. Seminar Room, House 20, 2pm. August 13-17, 2018. HMI Workshop The 11th Whitney Problems Workshop. Organized by Alex Brudnyi (University of Calgary), Charles Fefferman (Princeton University), Andreea Nicoara (Trinity College Dublin), Pavel Shvartsman (Technion), Nahum Zobin (College of William & Mary). July 30 - August 3, 2018. The 14th William Rowan Hamilton Geometry and Topology Workshop on Group Actions and Ergodic Theory in Geometry and Topology. The Hamilton Mathematical Institute, Trinity College Dublin. Organized by Ian Biringer (BC), Martin Bridson (Oxford), Vladimir Dotsenko (TCD), Brendan Guilfoyle (IT Tralee), Kathryn Lindsey (BC), Robert Meyerhoff (BC). June 17-21, 2018. HMI Workshop Geometric Computation and Applications. Organized by Rolf Klein (U Bonn), Colm Ó Dúnlaing (TCD), José Refojo (TCD), Chee-Keng Yap (Courant Institute). June 5-8, 2018. HMI Workshop Progress in Conformal Field Theory. Organized by Manuela Kulaxizi, Gim Seng Ng, Andrei Parnachev (all TCD) and Sasha Zhiboedov (Harvard). May 24, 2018. TCD School of Physics Colloquium. Michael Berry (Univ. of Bristol). Chasing the Dragon: Tidal Bores in the UK and Elsewhere; Guantum and Relativistic Analogies. Schrodinger Theatre, School of Physics, TCD. 2.30pm. May 14-18, 2018. HMI Workshop Scattering from the Lattice: Applications to Phenomenology and Beyond. Organized by Maxwell T. Hansen (CERN), Marina Krstic Marinkovic (TCD), Mike Peardon (TCD), Stefan Sint (TCD), Christopher Thomas (Cambridge), David Wilson (TCD). May 11, 2018. Special Mathematical Physics Seminar. John Joseph Carrasco (IPhT Saclay). Maximal Supergravity at 5-loops - Decoding the DNA of Prediction, from the Smallest to Largest Scales in Nature. New Seminar Room, School of Mathematics, TCD, 3.30pm. April 25, 2018. TCD Theoretical Physics Seminar. Juan Miguel Nieto (UCM). Quantum corrections to the dispersion relation in flux-deformed AdS_3/CFT_2. Seminar Room House 20, 4pm. April 16-20, 2018. HMI Workshop on Higher-Point Correlation Functions and Integrable AdS/CFT. Organized by Sergey Frolov (TCD), Tristan McLoughlin (TCD), Didina Serban (IPhT Saclay), Alessandro Sfondrini (ETH Zurich). April 4, 2018. Dublin Theoretical Physics Colloquium. Giuseppe Policastro (Ecole Normale Supérieure, Paris). Holographic Complexity and Defect CFT. Synge Lecture Theatre, 4pm. March 28, 2018. Dublin Theoretical Physics Colloquium. Constantin Bachas (Ecole Normale Supérieure, Paris). Massive AdS Gravity from String Theory. Synge Lecture Theatre, 4pm. March 22, 2018. Dublin Mathematics Colloquium. Herve Gaussier (Grenoble). About Curvature of Domains in the Complex Euclidean Space. Synge Theatre, 5pm. March 22, 2018. TCD Theoretical Physics Seminar. Tim Adamo (Imperial). Double Copy in Plane Wave Backgrounds. Seminar Room House 20, 2pm. March 21, 2018. Dublin Theoretical Physics Colloquium. Pietro Longhi (Uppsala). BPS Graphs of Class S Theories. Synge Lecture Theatre, 4pm. March 13, 2018. Trinity College Computational Applied Mathematics Seminar. Stefan Güttel (The University of Manchester, England). Restarted Arnoldi Methods for Matrix Function Approximation. Seminar Room, House 20, 2pm. March 7, 2018. Dublin Theoretical Physics Colloquium. Aleksi Kurkela (CERN). What Do Neutron Stars Teach Us about QCD? Synge Lecture Theatre, 4pm. March 6, 2018. Trinity College Computational Applied Mathematics Seminar. Isabel Campos (IFCA, IFT). Scientific Computing through Virtualization Technologies. Viz Room (201), 2nd floor, Lloyd Bld., TCD. February 22, 2018. Dublin Mathematics Colloquium. Estanislao Herscovich (Grenoble). Double Monoidal Categorical Structures Appearing in Quantum Field Theory. Synge Lecture Theatre, 5pm. February 22, 2018. Simons Foundation Distinguished Lecture. Mikhail Kapranov, HMI Simons Visiting Professor. Triangulated categorification, perverse sheaves and perverse Schobers. Synge Lecture Theatre, 4pm. February 22, 2018. TCD Theoretical Physics Seminar. Andrew McLeod (Niels Bohr Institute). Amplitudes and Cosmic Galois Theory through Six Loops in Planar N=4. Seminar Room House 20, 2pm. February 21, 2018. Dublin Theoretical Physics Colloquium. Alberto Zaffaroni (Milan). Microstate Counting for AdS Black Holes. Synge Lecture Theatre, 4pm. February 20, 2018. Trinity College Computational Applied Mathematics Seminar. Matthias Bolten (TU Wuppertal, Germany). Multigrid Methods for Structured Grids on Large-scale Supercomputers. Seminar Room, House 20, 2pm. February 14, 2018. Simons Foundation Distinguished Lecture. Konstantin Zarembo, HMI Simons Visiting Professor. Integrable Deformations of the AdS/CFT Duality. Synge Lecture Theatre, 4pm. February 9, 2018. HMI Mini-Conference. Speakers include Leon Takhdajan (Stony Brook), Nikita Nekrasov (SCGP, Stony Brook), Yuri Tschinkel (Simons Foundation, and Courant Institute, NYU). Synge Lecture Theatre, 10.30 - 4.45pm. February 7, 2018. Dublin Theoretical Physics Colloquium. Anastasios Petkou (ITP Thessaloniki). Modern CFT in d>2: Some Recent Results. Synge Lecture Theatre, 4pm. January 31, 2018. Dublin Theoretical Physics Colloquium. Alessandro Tanzini (SISSA). On Painleve’/Gauge Theory Correspondence. Synge Lecture Theatre, 4pm. January 25, 2018. Simons Foundation Distinguished Lecture. Konstantin Zarembo, HMI Simons Visiting Professor. String Quantum Corrections to Holographic Wilson Loops. Seminar Room, 2pm. January 24, 2018. Dublin Theoretical Physics Colloquium. Agostino Patella (CERN). Gauge-invariant Operators for Charged Hadrons. Synge Lecture Theatre, 4pm. January 18, 2018. TCD Theoretical Physics Seminar. Martijn Hidding (TCD). Direct Integration of Linearly Reducible Elliptic Feynman Integrals. Seminar Room, House 20, 2pm. January 17, 2018. Dublin Theoretical Physics Colloquium. Paul McFadden (University of Durham). Conformal anomalies and momentum-space CFT. Synge Lecture Theatre, 4pm. December 13, 2017. Dublin Theoretical Physics Colloquium. Tobias Hansen (University of Uppsala, Sweden). Bounds for OPE Coefficients on the Regge Trajectory. Synge Lecture Theatre, 4pm. December 7, 2017. Dublin Mathematics Colloquium. Wiesław Pawłucki (Jagiellonian University). Hironaka Rectilinearization in General O-minimal Structures. Synge Theatre, 5pm. December 6, 2017. Dublin Theoretical Physics Colloquium. Amir-Kian Kashani-Poor (ENS Paris). WKB and (Topological) String Theory. Synge Theatre, 4pm. November 29, 2017. Dublin Theoretical Physics Colloquium. Larus Thorlacius (University of Iceland). Exploring Emergent Geometry in Gauge/Gravity Duality. Synge Theatre, 4pm. November 27-December 1, 2017. HMI Workshop Hall Algebras and Related Topics, organized by Sergey Mozgovoy (HMI/TCD). November 23, 2017. Dublin Mathematics Colloquium. Natalia Iyudu (University of Edinburgh). Sklyanin Algebras via Groebner Bases and Finiteness Conditions for Potential Algebras. Synge Theatre, Hamilton Building, 5pm. November 22, 2017. Dublin Theoretical Physics Colloquium. Maxim Zabzine (University of Uppsala, Sweden). Gauge Theories and q-Virasoro Algebra. Synge Lecture Theatre, 4pm. November 20, 2017. TCD Theoretical Physics Seminar. Alexander Ochirov (ETH Zurich). From QCD to Quantum and Classical Gravity via Color-Kinematic Duality. Seminar Room, House 20, 2.30pm. 16 November, 2017. Dublin Mathematics Colloquium. Tobias Dyckerhoff (Bonn University). A Categorified Dold-Kan Correspondence. Synge Theatre, Hamilton Building, 5pm. 15 November, 2017. Dublin Theoretical Physics Colloquium. Cohl Furey (DAMTP). Generations: Three Prints, in Colour. Synge Theatre, Hamilton Building, 4pm. 15 November, 2017. How I Came to Hate Maths. Organized, as part of the Science Week 2017, by Victoria Lebed (HMI/TCD), this event will include the screening of the film by Olivier Peyon, discussion with international mathematicians, wine reception, and a small exhibition of popular maths books, students' posters, etc. Alliance Française Dublin, 1 Kildare Street 6.30 - 9.15pm. The event is free, but registration is required. 9 November, 2017. Dublin Mathematics Colloquium. Thomas Poguntke (Bonn University). Higher Segal Structures in Algebraic K-theory. Synge Theatre, Hamilton Building, 5pm. 2 November, 2017. Dublin Mathematics Colloquium. Yan Soibelman (Kansas State University). Riemann-Hilbert Correspondence, Fukaya Categories and Periodic Monopoles. Synge Theatre, Hamilton Building, 5pm. 1 November, 2017. Dublin Theoretical Physics Colloquium. Andrei Starinets (University of Oxford). Effects of Higher Curvature Gravity Terms on Dual Thermal QFTs in and out of Equilibrium. Synge Theatre, Hamilton Building (NOTE NEW VENUE), 4pm. October 23-27, 2017. HMI Workshop Geometry and Combinatorics of Associativity, organized by Vladimir Dotsenko and Victoria Lebed (HMI/TCD), including the Simons Foundation Lecture by Professor Mikhail Kapranov, funded by the Simons Foundation. October 23, 2017. TCD Theoretical Physics Seminar. Chaolun Wu (TCD). Holography and Pseudogap in High Temperature Superconductivity Seminar Room, House 20, 2pm. October 19, 2017. TCD Geometry Seminar. Yuuji Tanaka (Oxford University). On the Singular Sets of Solutions to the Kapustin-Witten Equations and the Vafa-Witten Ones on Compact Kahler Surfaces. SNIAM Lecture Room, TCD, 3pm. October 19, 2017. Dublin Mathematics Colloquium.Yuuji Tanaka (Oxford University). Vafa-Witten Invariants for Projective Surfaces. Synge Theatre, Hamilton Building, 5pm. October 18, 2017. Dublin Theoretical Physics Colloquium. Pierre Vanhove (CEA Saclay). Feynman Integrals and Mirror Symmetry. Synge Theatre, Hamilton Building, (NOTE NEW VENUE), 4pm. October 11, 2017. Dublin Theoretical Physics Colloquium. David Wilson (TCD). Resonances from Lattice QCD. New Seminar Room, House 20, 4pm. October 9, 2017. TCD Theoretical Physics Seminar. Raul Pereira (TCD). Extracting the Structure Constant of Konishi at Five Loops. New Seminar Room, House 20, 2pm. October 4, 2017. Dublin Theoretical Physics Colloquium. Masud Haque (Maynooth). Non-equilibrium Dynamics in Isolated Quantum Systems. New Seminar Room, House 20, 4pm. September 27, 2017. Dublin Theoretical Physics Colloquium. Matthias Staudacher (Humboldt University, Berlin - Germany). Maximally Compact Feynman Integrals and Integrability. New Seminar Room, House 20, 4pm. August 22-26, 2017. HMI Workshop Geometry and Dynamics of Moduli Spaces, organized by Ian Biringer (Boston College), Noel Brady (Oklahoma), Martin Bridgeman, Dawei Chen (Boston College), Brendan Guilfoyle (Tralee), and Andreea Nicoara (HMI/TCD). June 6-9, 2017. HMI Workshop Indefinite Theta Functions and Applications in Physics and Geometry, organised by Jan Manschot and Larry Rolen (HMI/TCD). May 2-5, 2017. HMI Workshop New Results in Quantum Field Theory and Holography, organized by Manuela Kulaxizi (HMI/TCD), Tristan McLoughlin (HMI/TCD), Andrei Parnachev (HMI/TCD). April 13, 2017. TCD Theoretical Physics Seminar. Gustav Mogull (Edinburgh). Two-Loop Fundamental Colour-Kinematics Duality. Seminar Room, House 20, 2pm. April 7, 2017. Dublin Mathematics Colloquium. Kobi Kremnitzer (Oxford University). Constructing Geometries. Salmon Theatre, Hamilton Building, 3pm. March 30, 2017. TCD Theoretical Physics Seminar. Marius de Leeuw (NBI). One- and Two-Point Functions in AdS/dCFT. Seminar Room, House 20, 2pm. March 30, 2017. Dublin Mathematics Colloquium. Franc Forstnerič (University of Ljubljana). Complete Bounded Submanifolds in Different Geometries. Synge Theatre, 5pm. March 29, 2017. Dublin Theoretical Physics Colloquium. Anastassios Vladikas (INFN and University of Rome 2, "Tor Vergata"). Standard Model Phenomenology from Lattice QCD. New Seminar Room, 4pm. March 23, 2017. TCD Theoretical Physics Seminar. Franz Herzog (NIKHEF). The R*-operation for Generic Euclidean Feynman Graphs. Seminar Room, House 20, March 23, 2pm. March 22, 2017. Dublin Theoretical Physics Colloquium. Balt van Rees (University of Durham - UK). The S-matrix Bootstrap Revisited. New Seminar Room, 4pm. March 20, 2017. Math-Physics Seminar. Georgios Korpas (TCD). BPS Spectra and 3-manifold Invariants. New Seminar Room, 2pm. March 16, 2017. Dublin Mathematics Colloquium. Brent Pym (University of Edinburgh). Divergent Series and the Stokes Groupoids. Synge Theatre, 5pm. March 16, 2017. TCD Geometry Seminar. Leandro Vendramin (University of Buenos Aires). Nichols Algebras and Applications. Old Seminar Eoom, 2pm. March 15, 2017. 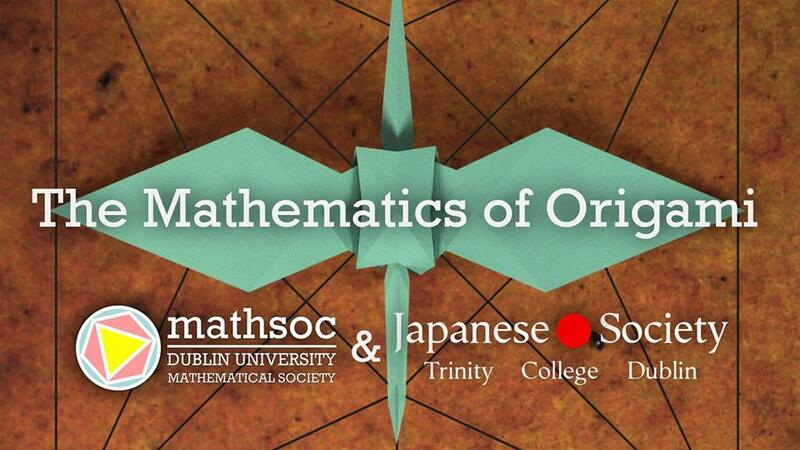 Dublin University Math Society and TCD Japanese Society. Victoria Lebed (TCD/HMI). The Mathematics of Origami. Salmon Lecture Theatre, 7.30pm. March 15, 2917. Dublin Theoretical Physics Colloquium. Jacob Bourjaily (NBI, Copenhagen - Denmark). Stratifying On-Shell Cluster Varieties. New Seminar Room, 4pm. March 8, 2017. Dublin Theoretical Physics Colloquium. Nazario Tantalo (University of Rome 2, "Tor Vergata"). Electrically charged hadrons in a box. New Seminar Room, 4pm. February 27 - March 3, 2017. Young Researchers Integrability School and Workshop. February 24, 2017. Modular Forms Seminar. Mariane Leitner (DIAS). The Minimal Case of Wiles' Main Conjecture, Part I. New Seminar Room, 3-4:30pm. February 23, 2017. Dublin Mathematics Colloquium. Sung Yeon Kim (CMC, KIAS). CR Maps between Boundaries of Flag Domains. Synge Theatre, 5pm. February 23, 2017. TCD Theoretical Physics Seminar. Christian Bogner (Humboldt University). Algorithms for computations with multiple polylogarithms. New Seminar Room, 2pm. February 22, 2017. Dublin Theoretical Physics Colloquium. Nick Dorey (DAMTP, Cambridge). Three Dimensional Mirror Symmetry and Spin Chains. New Seminar Room, 4pm. February 17, 2017. Modular Forms Seminar. Ivan Blanco-Chacon (UCD). Introduction to Deformation Theory. New Seminar Room, 3-4:30pm. February 16, 2017. Dublin Mathematics Colloquium. Antonio Giambruno (Palermo University). Polynomial Identities and their Growth. Synge Theatre, 5pm. February 15, 2017. Dublin Theoretical Physics Colloquium. Nadav Drukker (King's College London). The Exact Schur Index of N=4 SYM and Generalisations. New Seminar Room, 4pm. February 13, 2017. Math-Physics Seminar. Francisco Jose Garcia Abad (TCD). Quantum Complexity and Negative Curvature. New Seminar Room, 2pm. February 10, 2017. Modular Forms Seminar. Stiofain Fordham (UCD). Ribet's Proof of the Epsilon Conjecture. Old Seminar Room, 9-10:30am. February 9-10, 2017. HMI Mini-Conference. Speakers include Gregory Gabadadze (NYU), Maxim Kontsevich (IHÉS), Nikita Nekrasov (SCGP), Andrei Okounkov (Columbia), Volker Schomerus (DESY), Yuri Tschinkel (Courant, NYU). Trinity News and Events Press Release. February 3, 2017. Modular Forms Seminar. Stiofain Fordham (UCD). Roadmap of Proof of Fermat's Last Theorem. 3-4:30pm, New Seminar Room. February 2, 2017. Dublin Mathematics Colloquium. Norbert Hoffmann (University of Limerick). Del Pezzo Surfaces and Universal Torsors. Synge, 5pm. January 26, 2017. Dublin Mathematics Colloquium. Hans Franzen (Bochum University). Geometric properties of quiver Grassmannians. Synge, 5pm. January 26, 2017. Geometry Seminar. Hans Franzen (Bochum University). Donaldson-Thomas invariants of quivers via Chow groups of quiver moduli. Old Seminar Room, 3pm. January 25, 2017. Dublin Theoretical Physics Colloquium. Zoltan Bajnok (Wigner Research Center for Physics, Budapest). Integrability and the holographic duality. New Seminar Room, House 20, 4pm. January 18, 2017. Dublin Theoretical Physcis Colloquium. Omer Gurdogan (University of Southampton). “The chiral limit of deformed N=4 super Yang Mills and ABJM and integrable Feynman integrals." New Seminar Room, House 20, 4pm. December 16, 2016. Modular Forms Seminar. Blanco-Chacon (UCD). Modular Forms as Representations. New Seminar Room, 3pm. December 14, 2016. Dublin Theoretical Physics Colloquium. Daniel Nogradi (Eotvos University, Budapest). Strong Dynamics and Composite Higgs on the Lattice. New Seminar Room, 4pm. December 9, 2016. Dublin Mathematics Colloquium. Nikos Diamantis (University of Nottingham). Values of L-functions and Shifted Convolutions. Synge Theatre, 4pm. December 9, 2016. Modular Forms Seminar. Jan Manschot (TCD). Poincare Series and Applications to Physics. New Seminar Room, 3pm. December 7, 2016. Dublin Theoretical Physics Colloquium. Anatoly Konechny (Heriot-Watt, Edinburgh). Renormalization Group Boundaries and Interfaces in the Ising Field Theory. New Seminar Room, 4pm. December 2, 2016. Modular Forms Seminar. Larry Rolen (TCD). Jacobi Forms. New Seminar Room, 3pm. December 1, 2016. THIRTEENTH J.L. SYNGE PUBLIC LECTURE titled THE BIRTH OF THE UNIVERSE was given by Professor George P Efstathiou, FRS, Professor of Astrophysics and the first Director of the Kavli Institute for Cosmology at Cambridge. MacNeill Lecture Theatre 3, Hamilton Building, Trinity College. 7.30 pm. December 1, 2016. Dublin Mathematics Colloquium. Arnaud Mortier (DCU). Knots, Virtual Knots, and Finite-type Invariants. New Seminar Room, 4.30pm. December 1, 2016. TCD Geometry Seminar. Arnaud Mortier (DCU). Finite-type Cohomology of the Space of Long Knots. Old Seminar Room, 3pm. November 30, 2016. Dublin Theoretical Physics Colloquium. Ioannis Papadimitriou (SISSA - Trieste, Italy). AdS_2 holography and non-extremal black holes. New Seminar Room, 4pm. November 25, 2016. Modular Forms Seminar. Stiofain Fordham (UCD). Complex Multiplication. New Seminar Room, 3pm. November 24, 2016. Geometry Seminar. Tyler L. Kelly (University of Cambridge).Unifying Mirror Constructions. Synge Theatre, Hamilton Building, 5pm. November 24, 2016. Math-Physics Seminar. Dmytro Volin (TCD). On the Sachdev-Ye-Kitaev Model - Part 2. New Seminar Room, 2pm. November 23, 2016. Dublin Theoretical Physics Colloqium. Damian Galante (University of Amsterdam, The Netherlands). Shape Dependence of Holographic Rényi Entropies. New Seminar Room House 20, 4pm. November 21, 2016. TCD Theoretical Physics Seminar. Luise Adams (Mainz). The Sunrise and the Kite Integral in Terms of an Elliptic Generalisation of the Multiple Polylogarithms. New Seminar Room House 20, 2.30pm. November 18, 2016. Modular Forms Seminar. Georgios Korpas (TCD). Modular L-functions and Connections with Elliptic Curves. New Seminar Room, 3pm. November 17, 2016. Dublin Mathematics Colloqium. Herve Gaussier (Grenoble). How Can Metrics Explain Some Geometric Properties of Complex Manifolds? Synge Theatre, Hamilton Building, 5pm. November 17, 2016. Math-Physics Seminar. Dmytro Volin (TCD). On the Sachdev-Ye-Kitaev Model - Part 1. New Seminar Room, 2pm. November 16, 2016. Dublin Theoretical Physics Colloqium. Konstantin Zarembo (Nordita, Stockholm). Precision Tests of Non-Conformal Holography. New Seminar Room House 20, 4pm. November 14, 2016. TCD Theoretical Physics Seminar. Samuel Abreu (Freiburg). The Diagrammatic Coaction of Cut Feynman Integrals. New Seminar Room House 20, 2.30pm. November 4, 2016. Modular Forms Seminar. Sergey Mozgovoy (TCD). Hecke Operators. New Seminar Room, 3pm. November 3, 2016. Math-Physics Seminar. Francisco Jose Garcia Abad (TCD). On the S-matrix Bootstrap. New Seminar Room, 2:00pm. November 2, 2016. Dublin Theoretical Physics Colloqium. Massimo Taronna (ULB, Brussels). Higher-Spin Holography, Cubic Interactions and Beyond. New Seminar Room House 20, 4pm. October 28, 2016. Modular Forms Seminar. Larry Rolen (TCD). Modular Functions. New Seminar Room, 3pm. October 27, 2016. Geometry Seminar. Emmanuel Letellier (Paris Diderot-Paris 7 University). Higgs Bundles and Indecomposable Parabolic Vector Bundles over the Projective Line. Old Seminar Room, 3pm. October 27, 2016. Dublin Mathematics Colloqium. Emmanuel Letellier (Paris Diderot-Paris 7 University). Character Varieties and Representation Theory. Synge Theatre, Hamilton Building, 5pm. October 26, 2016. Dublin Theoretical Physics Colloqium. Christoph Keller (ETH, Zurich). Mathieu Moonshine and Symmetry Surfing. New Seminar Room House 20, 4pm. October 24, 2016. TCD Theoretical Physics Seminar. Joao Penedones (ETH, Lausanne - Switzerland). S-matrix Bootstrap Revisited. New Seminar Room House 20, 2.30pm. October 21, 2016. Modular Forms Seminar. James Boland (TCD). The Valence Formula and Dimensions of Spaces of Modular Forms. New Seminar Room, 3pm. October 20, 2016. Geometry Seminar. Raf Bocklandt (University of Amsterdam). Moduli of Matrix Factorizations. Old Seminar Room, 3pm. October 20, 2016. Dublin Mathematics Colloqium. Raf Bocklandt (University of Amsterdam). From the Freezer to the Tropics. Synge Theatre, Hamilton Building, 5pm. October 17, 2016. TCD Theoretical Physics Seminar. Tim Adamo (Imperial College London). Twistor Methods for AdS_5. New Seminar Room House 20, 2.30pm. October 17, 2016 we celebrate W.R.Hamilton's Day. RIA organizes an Annual Hamilton Lecture at Trinity College. The Lecture is kindly supported by Arup and the Irish Times. The 12th William Rowan Hamilton Geometry and Topology Workshop, August 2016. Last updated 15 April 2019 @tcd.ie>.